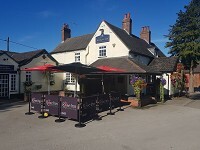 The Rose sits opposite the site of the old Baddesley colliery, behind the village green and duck pond with an orchard and large relaxing area overlooking the pond. Originally believed to be a 'Gentleman's residence', the building dates back to the 18th century and has served as a courthouse, jail, mortuary and for more than a hundred years as a public house. We are Good Beer Guide regulars offering great cask ales and a comprehensive locally sourced menu with excellent steaks, a varied selection of homemade specialities with vegetarian options, and our chef's Specials. a restaurant and function room for larger events including beer and skittles, weddings and conferences. and their dogs are always welcome. Book your table in advance online, just use the booking module on the left. Please note that bookings are subject to confirmation. Are you always pushed for time at lunch? fancy something more exciting than a jam sandwich from home but don't have the time to wait for your order to be cooked? Our online pre- ordering service is perfect for you then. Just browse our menu, order what you want along with any friends or work colleagues and it will be ready for you a few minutes after your stated arrival time. There is no additional charge for this service.